Out of my depth! 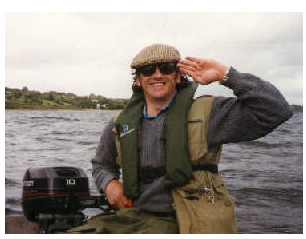 In 1997 with negligible boat fishing experience and quite terrified by the size of some of the waves. There was a local bloke there though, happily fly-casting at a semi-submerged reef, swigging from a bottle of Jamesons. Later we spoke to him, and he told us he was tired because he had been away dancing in Sligo the night before. "That's a long way to go for a bit of dancing" I said. "To be sure," he replied, "It's fifteen pubs away".